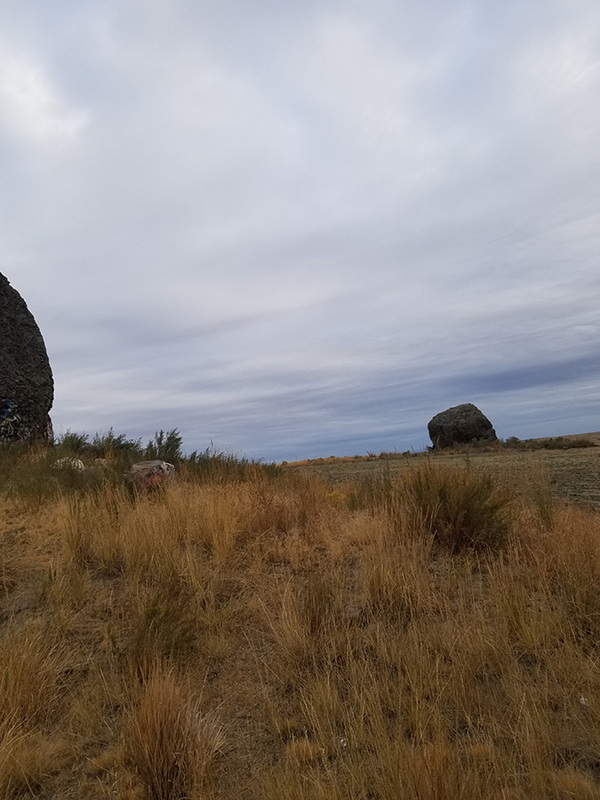 In the open plains of Washington, northwest of Coulee City, in a farmer’s field there is a huge boulder sitting just off highway 170. This is a massive rock is the size of a house, just sitting in a field. Looking at this erratic many questions spring to mind; how did this get here? What is it made of? What can move this? Yeager Rock is made of basalt from the Wampum Basalt, part of the Colubmia River Basalt Group. 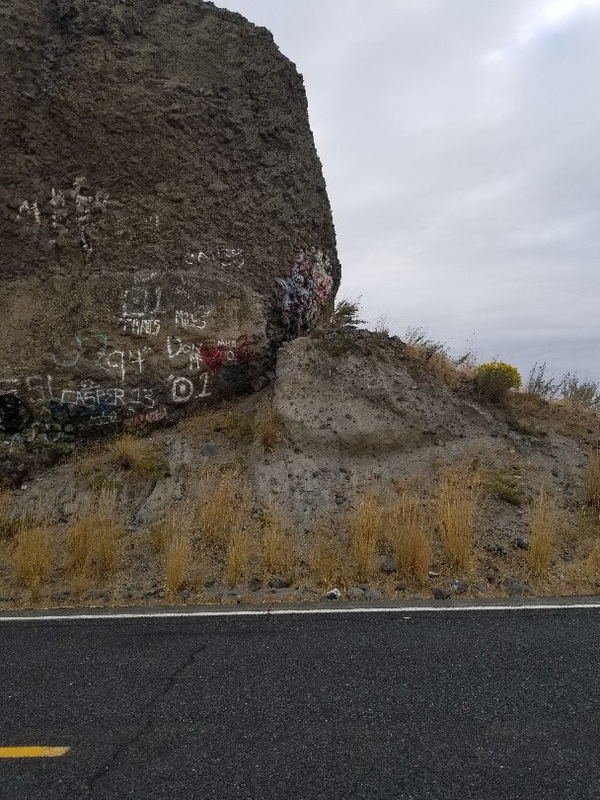 Cataclysmic fissures opened and spilled a low viscosity lava out flooding a large section of Washington, as well as parts of Oregon and Idaho. The fissure is argued to have originated 16 million years ago, loosely associated with the Yellowstone hot spot, originating around the Washington, Idaho, Oregon border (Reidel et al., 2016). The lava had a low silica level and was very iron rich just like todays Pahoehoe lava flows found in Hawaii. 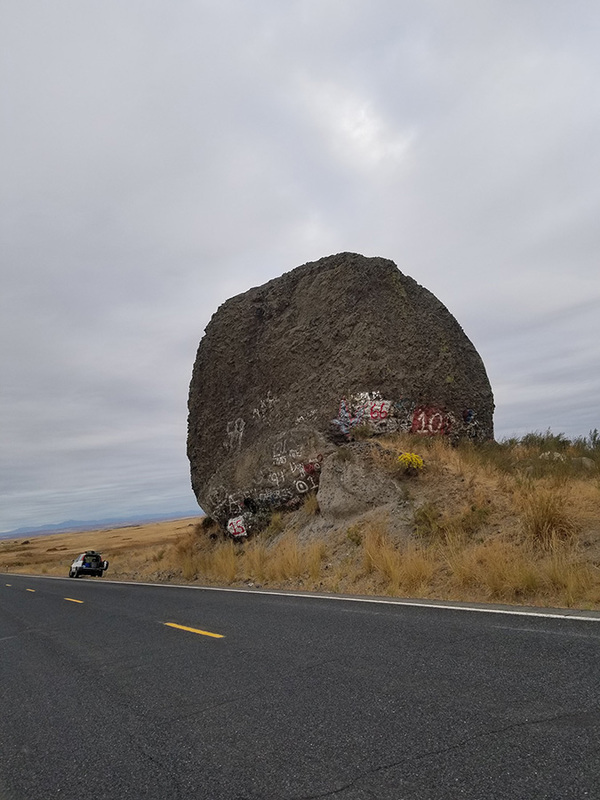 This might explain the origins of Yeager rock, but not how this boulder got into a farmer’s field. There are no mountains near by that this rock could have fallen off of, or some larger mass of basalt near it. These rule out gravity being the mechanism of moving this rock, it did not fall or roll into its current resting point. The surrounding area is flat with a few other large boulders and rolling hills stretching off into the distance. The underlining bedrock for this region is all basalt that comes from the lava flows, but you would expect to see a large hole where Yeager Rock was plucked from (Bjornstad and Kiver, 2012). After closer inspection of the surrounding area a key detail started to stand out. The area is dead flat then there is Yeager Rock with a few other boulders just dropped here almost randomly. The soil that Yeager Rock Sits on has no layering, little to no rounding and grain sizes ranging from super fine dust up to serous cobbles. This is the Hallmark of glacier till. Glaciers must have plucked this massive boulder out of the underlining bedrock as they steam rolled across this region and when the glaciers retreated about 13 thousand years ago they must have just dropped Yeager rock where it sits today (Bjornstad and Kiver, 2012). When you think glaciers, the typical Alpine glaciers come to mind, large sheets of ices hanging off mountains and feeling some body of water as they slowly carve U-shaped valleys. But there is another uncommon Glacier formation that we do not often think about, that is the continental Glaciers. Today they are found in Green Land and Antarctica but during the ice ages not that long ago in geologic time they were all over the norther and southern hemisphere. They don’t need a mountain to generate them they form on flat areas and glow gigantic and spread out, flattening everything in their ever-expanding wake. Continental Glaciers must have plucked Yeager rock from some of the basalt bedrock and moved it in a substantial way and then dropped it as the glaciers melted and retreated (Bjornstad and Kiver, 2012). 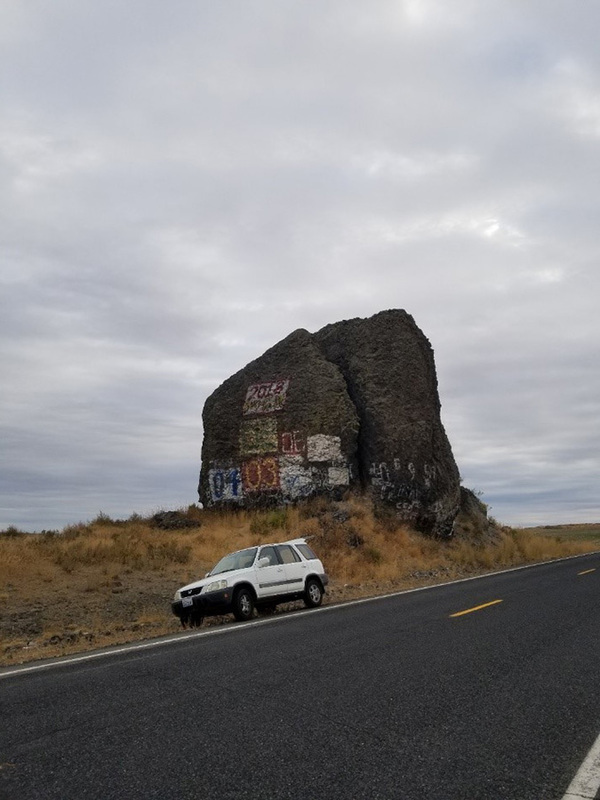 Now this boulder rest in a farm field ,tormented by graffiti-folks of various abilities, but more importantly provides evidence that the immense walls of ice existed here in central Washington during the ice ages. Levi Olson, “Yeager Rock, Debris of the Colossus ,” Ice Age Floods Explorer, accessed April 21, 2019, http://floodexplorer.org/items/show/62.